A GeoMarker represents a location on earth, and it usually has a name to help you recognize it. It can be your house, where you parked your car, a good camping spot in a forest or anything else that you can think of. The power of GeoMarkers is that you do not need a data connection to add/find them. This makes them very useful on holidays, when you are hiking for example. It's no surprise that it's when you are not home that you need more help finding places around you - and data connection is then costly. 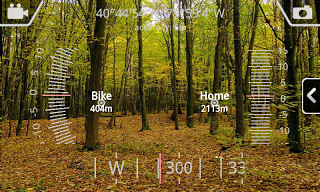 Prepare a list of key places in an area and view them with your camera on augmented reality: name, distance. You will not require a data connection offline so it can be used when hiking abroad, when visiting another city... This will help you make sure you are going in the right direction and give you remaining distance. You can also add markers on the fly during your hike with the "Add here" option, for example to flag the base camp, a water source, or anything interesting you find on your way. There are three ways to add a GeoMarker. If you do not have a GPS fix, or simply want to enter some markers for a location that you plan to visit later, you can input their coordinates directly. This is done via the "Add from coordinates" item on the same menu. It will show you a dialog where you should input the coordinates for the marker you wish to create. 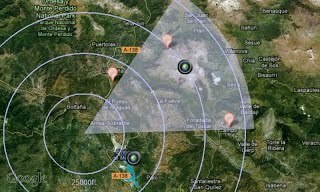 You can choose to input the coordinates as decimal angle (eg 40.74843, 73.98454) or in the degree-minute-second format (eg 40 44 54, 73 59 40) or using the Military Grid Reference System (MGRS, eg 02CNR0634657742) . 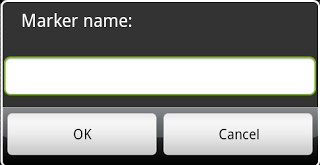 You will then be brought to the above dialog to enter a name for your Marker. 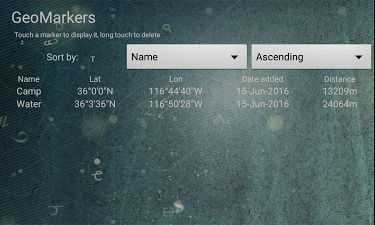 Lastly, you can add a Geo-Marker directly from the Map, follow the link to find out how. Long touch any location on the map and you will be prompted for a name for your new Geo-Marker. To view them on the Map with your pictures, select Geo > Map> Show Geocam Map. You will see all your geotagged pictures and markers on Google Maps. To view them in Google Earth, see Export a KMZ.